Heavy duty Ripstop 210D Oxford Material, engineered for tough protection against rain, snow UV and dust. Our technology ensures your bike will be snug, dry and clean even in the harshest of weather. 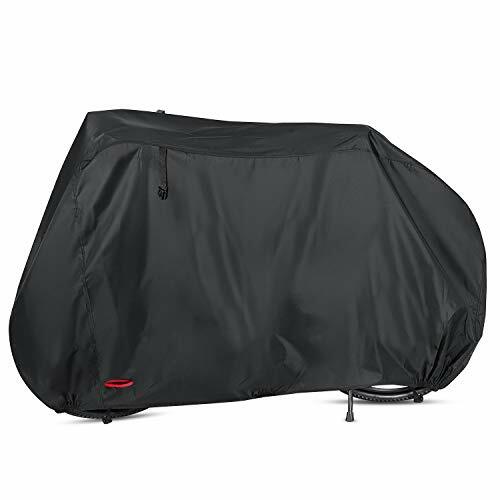 Whether you store your bike inside a garage or in the yard, you want it to stay dry, without dust or scratches and protected against sunlight - that's what this high quality 210D Oxford Fabric waterproof cover will do for you. Thanks to the heat seamed sealing, Anglink bicycle cover is completely waterproof. -210D Oxford Fabric Material with PU coating and Waterproof Strip on the seams, extremely durable. -Security eyelets at the front, enabling the cover to be locked securely through the bikes front wheel, deterring theft (lock not included). -Front and rear elastic hems, to ensure a correct fit. Storm strap situated at the rear, to keep the cover in place during windy conditions. -High-quality drawstring pouch for easy and convenient storage. 【Durable & Waterproof Protection】Durable & Waterproof Protection: 210D Oxford Fabric with 'double stitching' & 'heat sealed' seams, completely resolve the problem of water seepage of other similar products.which is more weather-resistant, tear-resistant and wear-resistant than 180T, 190T material. Anti-UV, Waterproof, Dust-proof, well protected your bike from any scratches. 【Safety Lock-hole Design】2 anti-theft cloth lock holes better than traditional metal lock hole, you do not need to worry about rust, metal-off and other issues, perfect for bicycle outdoor storage. 【Large Size and Fit Most Bike】Dimensions: 78.7" L x 27.6" W x 43.3"H, Please measure your bike before your purchase. Suitable for 29er, Mountain, Road, Comfort, Hybrid, Cruiser. and other bikes up to 29" wheel size. If you have any questions about this product by Anglink, contact us by completing and submitting the form below. If you are looking for a specif part number, please include it with your message.